The Library Arts Center is a regional cultural and arts center, where residents and visitors can observe, study and participate in the Arts. It has served the community since 1967, when renovations transformed the Victorian carriage house behind the Richards Library into a spacious main gallery with a small stage, a backstage gallery and an art studio on the floor below. 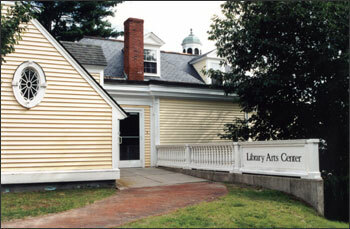 The Library Arts Center (LAC) operates under the umbrella of the Richards Free Library, and is housed in the library’s former carriage house. The LAC is ultimately accountable to the RFL, however, the Library Arts Center raises its funds separately and is governed by its own board of directors. The Library Arts Center receives some municipal tax support however, it is primarily funded by membership donations, business sponsorships, grants from the New Hampshire Charitable Foundation: Upper Valley Region and other foundations, fund-raising events and interest paid from an endowment fund. Gifts to the Arts Center and endowment from individuals, businesses and foundations help to insure and maintain long-term excellence in Arts Center programs.